Financial Reports: What Will You Find on Statement of Cash Flows? Basically, a statement of cash flows gives the financial report reader a map of the cash receipts, cash payments, and changes in cash that a company holds, minus the expenses that arise from operating the company. The statement also looks at money that flows into or out of the firm through investing and financing activities. Companies provide three years’ worth of information on the statement of cash flows. 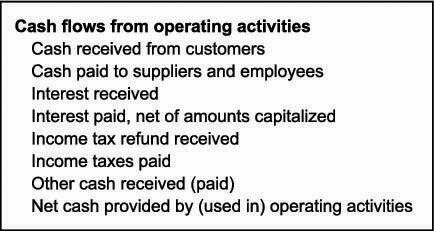 Where did the company get the cash needed for operations during the period shown on the statement — from revenue generated, funds borrowed, or stock sold? What cash did the company actually spend during the period shown on the statement? What was the change in the cash balance during each of the years shown on the statement? Knowing the answers to these questions helps you determine whether the company is thriving and has the cash needed to continue to grow its operations or the company appears to have a cash-flow problem and may be nearing a point of fiscal disaster. Operating activities: This part includes revenue the company takes in through sales of its products or services and expenses the company pays out to carry out its operations. Investing activities: This part includes the purchase or sale of the company’s investments and can include the purchase or sale of long-term assets, such as a building or a company division. Spending on capital improvements (upgrades to assets the company holds, such as the renovation of a building) also fits into this category, as does any buying or selling of short-term invested funds. Financing activities: This part involves raising cash through long-term debt or by issuing new stock. It also includes using cash to pay down debt or buy back stock. Companies include any dividends paid in this section. 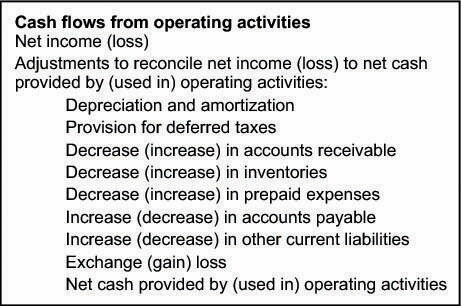 Operating activities is the most important section of the statement of cash flows. In reading this section, you can determine whether the company’s operations are generating enough cash to keep the business viable. Direct method: The Financial Accounting Standards Board prefers the direct method, which groups major classes of cash receipts and cash payments. For example, cash collected from customers is grouped separately from cash received on interest-earning savings accounts or from dividends paid on stock the company owns. Major groups of cash payments include cash paid to buy inventory, cash disbursed to pay salaries, cash paid for taxes, and cash paid to cover interest on loans. Indirect method: Most companies (90 percent) use the indirect method, which focuses on the differences between net income and net cash flow from operations, and allows firms to reveal less than the direct method, leaving their competitors guessing. The indirect method is easier to prepare. The direct and indirect methods differ only in the operating activities section of the report. The investing activities and financing activities sections are the same. Using the indirect method, you just need the information from two years’ worth of balance sheets and income statements to make calculations. For example, you can calculate changes in accounts receivable, inventories, prepaid expenses, current assets, accounts payable, and current liabilities by comparing the totals shown on the balance sheet for the current year and the previous year. If a company shows $1.5 million in inventory in 2011 and $1 million in 2012, the change in inventory using the indirect method is shown easily: “Decrease in Inventory — $500,000.” The statement of cash flows for the indirect method summarizes information already given in a different way, but it doesn’t reveal any new information. With the direct method, the company has to reveal the actual cash it receives from customers, the cash it pays to suppliers and employees, and the income tax refund it receives. Someone reading the balance sheet and income statement won’t find these numbers in other parts of the financial report. In addition to having to reveal details about the actual cash received or paid to customers, suppliers, employees, and the government, companies that use the direct method must prepare a schedule similar to one used in the indirect method for operating activities to meet FASB requirements. Essentially, companies save no time, must reveal more detail, and must still present the indirect method. Why bother? You can see why you’ll most likely see the indirect method used in the vast majority of financial reports you read. The investing activities for both the direct and indirect methods look something like this. The financing activities for both the direct and indirect methods look something like this.